The sweet taste of walleye is the perfect complement to the spicy flavors of the Southwest. If you like fiery food, increase the cayenne in both the marinade and the spice rub. The tortilla sauce is a wonderful addition, but if time is short, the recipe is excellent without it. Place all marinade ingredients in a medium bowl and whisk until blended. Pour half the marinade in a flat non-reactive dish. Lay the fillets flat in a single layer. Pour the remaining marinade over the fish. Cover and refrigerate marinade for 1 hour. For the tortilla sauce, heat the olive oil in a pot over medium-high heat until hot but not smoking. Add the garlic and sauté for several minutes, until fragrant. Add the onions, celery and jalapeño and continue to cook, stirring frequently until the onions are transparent. Add the spices and cook another two to three minutes. Stir the chopped tomato into the mixture, then add the chicken stock and stir well. Bring to a boil, reduce the heat slightly, and cook for 10 minutes. Add the tortilla chips, reduce the heat to medium low, and cook for approximately 20 minutes until the chips become soft. Add the cheese and stir until blended. This is a thick sauce. If you need to thin it, add additional chicken stock. Keep the sauce warm until ready to serve. For rub, in a small bowl, combine all of the spices and blend well. Just before grilling, remove the walleye from the marinade. Sprinkle both sides of the fillets liberally with the spice mixture and rub it onto the fish. Grill over medium-high heat for about 4 minutes per side or until the fish becomes opaque in the thickest section. Place a heaping ⅓ cup of the tortilla sauce on each plate and top with the grilled fish. 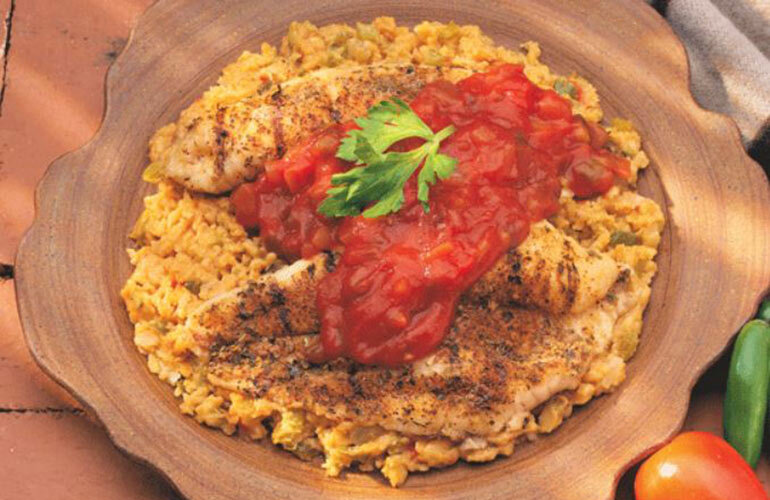 Top each walleye fillet with a tablespoon of your favorite commercial tomato salsa. Serve and enjoy!